It's some interesting topic! 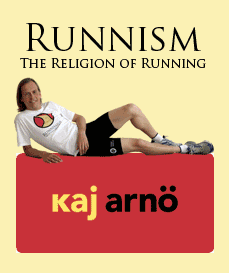 : Runnism, the Religion of Running -- why? It all sounds like a bad Nike commercial. No matter though, Cyclisim will surely smite the blasphemy of Runisim in due time. @Bill thanks for the pointer to that Emacs religion discussion! Now, that's not my style of interpreting how to apply the concept of religion to running. I'm also not into a Holy War against related "religions". In fact, as for Cyclism, I'm just back from a 400 km trip from Garmisch-Partenkirchen (Germany) over Austia and Switzerland to Lago di Garda (Italy), gathering 5000 vertical height metres in the process. I was new to mountain biking, and I think the main reason that I still made it is that I've been running. Runnism enables a life to the fullest, in particular involving other sports than running! Välkommen till Göteborg på världens största halvmara. Jag brukar springa varje år.